Regarding FILM, an installation that took place from 11 October 2011 to 11 March 2012 as part of Tate Modern’s Unilever Series, the artist Tacita Dean remarks that ‘it is a platform for me to say let’s protect film’. Dean’s simple, bold statement will allow me to expand upon the importance of this work and FLOH – her earlier artist’s book of collected photographs – in regard to her crusade to illustrate the importance of analogue film technology. Whereas issues of memory and preservation are heavily articulated throughout Dean’s entire oeuvre, my discussion will be restricted primarily to these works, since they allow great insight into two analogue mediums and how viewers engage with such material. Dean’s appreciation for analogue filmmaking is motivated by her belief that it can capture what a digital device cannot. This sentiment is best illustrated in Dean’s 2001 film The Green Ray (Fig. 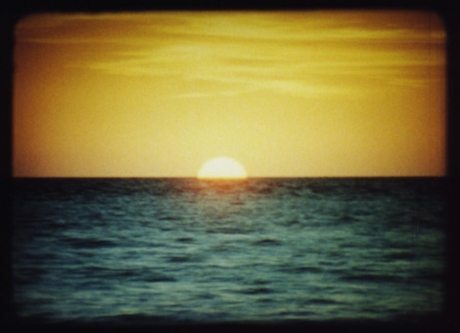 1), which is the product of her attempt to capture and document the ‘last ray of the dying sun to refract and bend beneath the horizon’ on 16mm film while visiting Madagascar. Whereas Dean’s camera was able to preserve this fleeting moment, other filmmakers who captured this scene on digital video were unsuccessful. According to Dean, the green ray ‘proved itself too elusive for the pixilation of the digital world’. This experiment, moreover, exemplifies the variances that occur when capturing subject matter on different technological devices; The Green Ray concerns how the scene was captured and also the visual qualities that separate it from its digital complement. The film should therefore not serve as a record of who was successful at capturing the last green ray, but rather demonstrate how the images are inherently and visually different even though they depict the same scene. Fig. 1: Dean captures the green ray. Dean believes analogue film technology must continue to exist if we wish to demonstrate the difference between it and its digital successor. This concern is increasing as photochemical labs continue to close and film stock becomes scarcer. Dean, however, continually rebuffs the restrictions that are created by fiscal constraints and companies’ decisions to focus their attention on digital formats and devices. Film is a fading medium, and though it may seem pessimistic to posit that the dominant method of capturing and exhibiting the world for over 100 years could potentially disappear, rapid developments in digital technology continue to provoke its decline. Dean’s concerns are not only espoused by other artists, but by a diverse group of people including film conservators, historians, curators, chemists, software designers, and theorists. Representatives from these fields and others were given the opportunity to voice their own perspectives in Tate Modern’s catalogue for FILM, demonstrating that Dean is not alone in her crusade to preserve this dying medium. [m]ost archives incite a fascination with a return to origins, beginnings, and sources. Yet they may also direct our attention in the opposite direction, toward an uncertain future. More specifically, Dean’s artistic practice reflects the preservation concerns of archivists who work with film and other audiovisual media. This comparison is demonstrated not only through Dean’s interest in analogue technology but by her practices of collecting, preserving, and presenting her works as well. Similar to an archivist, an artist forms a relationship with his subject matter through tactile interaction. Archivists are currently experiencing a situation that is akin to Dean’s since digital technology continues to perturb their realm as well; similar to filmmaking, the present is also a transitional period for archival practice. Servers and the Internet are increasingly employed as digital repositories for records that may be deemed too fragile to be handled by inquiring researchers, and while these digitised copies allow a researcher to access documents, they deny the tactile connection that he may hope to have with an article. Hal Foster reiterates this loss of connection, explaining that ‘in most archival art the actual means applied to these “relational” ends are far more tactile and face-to-face than any Web interface’. Dean’s responsibility to her viewers, however, differentiates her from institutional archival practice. For example, Dean is not imbued with the same authority as an institutional archive. This model is traditionally understood as a repository for the state. Instead, the material she selected for FLOH and FILM can be examined using the practice of ‘anomic archiving’, which has been discussed by Ernst van Alphen in his study of Els Vanden Meersch’s artists’ books. This alternative model allows for a discussion of archival practice that exists outside of established classification methods and where order within a collection is not self-evident. My objective in examining FLOH and FILM through this lens is not to align Dean’s anomic approach with analogue technology and institutional archives with prescient digital possibilities – that topic is far more complicated and requires further examination. I will instead assume Dean’s standpoint when she questions why analogue and digital formats cannot co-exist. In examining these two projects, I am able to create a dialogue between analogue formats and demonstrate how both artworks cause viewers to contemplate their contents and mediums in an age where digital continues to encroach and consume the ongoing creation of our collective visual repertoire. The term ‘anomie’ is as malleable as the artworks to which it is applied by van Alphen and myself. As defined, it refers to an absence of standards or norms within a society. It can be further expanded to include the condition a person experiences: anxiety, alienation, and unrest. Negative connotations have historically been attached to this term through its associations with French sociologist Émile Durkheim and his book The Division of Labour in Society. It was in this publication that he first used the term to discuss how established norms and values were disappearing at the dawn of the 20th century. For Durkheim, anomie materialised when societies evolved from an organic state to a mechanical one, which was more complex, impersonal, and egoistic. Without shared goals, concerns, and guidelines, individuals struggled to define their place in society and this uncertainty then led to conflict and deviant behaviour. While the term has been imbued with negative connotations, it can be re-interpreted and used to demonstrate how a lack of norms or regard for established guidelines challenge our understanding of what it means to preserve the past and anticipate the future. For van Alphen, anomic projects offer an alternative approach to collecting that resists the categorisation that is typically demonstrated by institutional archives, whose methods tend to eliminate elements of mystery and contingency that are increasingly considered less important in a world that stresses perfection and rationality: ‘[t]he acts of collecting and archiving introduce meaning, order, boundaries, and reason into what is disparate and confused, contingent and without contours.’ While van Alphen creates a dichotomy between institutional and more experimental or artistic models of archiving, it must not go unsaid that deeming a method to be anomic is itself problematic, since it classifies a process that aims to discourage this very act of categorisation. Though considering something to be anomic can be viewed as contradictory, this stance still offer an alternative lens with which to view archiving outside the boundaries of institutional practice. A primary concern that van Alphen stresses is how an object loses its unique qualities when it is documented and included in an institutional archive. For him, an archive has an inherent need to impose order upon items that are otherwise untamed: ‘[u]niqueness, specificity, and individuality are destroyed within the process of archiving.’ When accepted into an archive’s holdings, these objects only exist in relation to other objects or even the overall category to which they are assigned. However, the opposite occurs in anomic examples, since they contain material that would not be included in an institution’s collection. It is through this alternative process that ‘the worthless and unnoticed is rendered exceptional, comes into being, and becomes visible by virtue of simply being collected’. An object’s uniqueness, moreover, is particularly important in an age that has valued mass production for more than a century. Anomic archiving can therefore be considered a measure that aims to preserve and value an object’s unusual or remarkable nature. [b]ereft of primary cultural value and/or circulation, the items in these collections are no longer in use, and the pleasure they offer is derived in part from their inherent anachronism and/or marginalization, which renders them witnesses, or traces, of a different time. Displacing economic or aesthetic criteria, their main worth is often based on ‘possession,’ or its imaginary experience. Vanden Meersch and Dean are inspired by what is unknown. Their decisions to feature the seemingly mundane allow such objects to assume new semiotic meaning. The structure of the book provides an interesting display choice for many reasons. For example, the book has historical significance, since it can be considered the most influential method of arranging photographs. At the same time, van Alphen considers the book to be a form of container since it is capable of imposing a linear narrative with a beginning and an end, which is significant for books that include little or no accompanying text. Archives, in contrast, are open-ended and non-linear. Historical narratives are constructed depending on how and what material is consulted. The artists’ books created by Vanden Meersch and Dean occupy a liminal space between these two readings: they are closed in the sense that material cannot be added once they are published, but open since each viewer continually attributes meaning to their contents. It is also relevant that Dean chose to display her photographs in this way, as her concerns for analogue technology can be extended to the book, which itself faces extinction due to increasingly pervasive digital formats and carriers. What is notable about Vanden Meersch’s and Dean’s books is how they manage to avoid any classification scheme; in doing so, the photographs are able to maintain their uniqueness, since they are not confined to a pre-determined structure. This is possible with Vanden Meersch’s work, even though she has expressed a theme for some of her books. For example, the theme for Implants (Fig. 2) – Vanden Meersch’s third artist’s book – is the memory of architecture. Although the use of a theme can be considered a classification method, hers is rather open-ended and causes the viewer to ponder exactly what he is supposed to remember. This experience of the work is prompted by Vanden Meersch’s diverse subject matter that depicts a multitude of spaces from varying visual perspectives. Similarly, Dean’s work FLOH includes photographs that vary widely in content, style, temporality, and physical condition. No distinct category emerges from either artist’s book. Fig. 2: What appears to be an abandoned office building in Vanden Meersch’s Implants. While Vanden Meersch is more informed about her subject matter since she took the photographs herself, Dean is less so since she discovered her images at flea markets. Therefore, the images in both books do not attempt to serve a documentary purpose. This is further emphasised in Dean’s book, since the provenance of each image is unknown, leaving both Dean and her viewer to imagine their origins. A lack of provenance, however, still allows Dean to imbue the photographs with meaning by including them in FLOH. 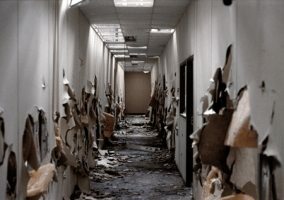 The same observation can be made of Vanden Meersch’s subject matter in Implants, since it consists of abandoned buildings and other neglected environments. Both of these acts encourage the production of semiotic renewal, as these artists and their viewers ascribe their own readings onto these images. Artists’ books commonly encourage this imaginative engagement since something is ‘suggested or produced by going from one image to the next’. Reading the images either singly or in relation to the others causes a viewer’s own categories or themes to emerge, thus resulting in the creation of many different narratives or even histories. Artists’ books actively encourage this emotional engagement on the part of the viewer. [t]he archives at issue here are not databases in this sense; they are recalcitrantly material, fragmentary rather than fungible, and as such they call out for human interpretation, not machinic processing. Although the contents of this art are hardly indiscriminate, they remain indeterminate like the contents of any archive, and often they are presented in this fashion – as so many promissory notes for further elaboration or enigmatic prompts for future scenarios. Though Foster does not differentiate between various archival models, his views suggest the qualities of the anomic archive. Additionally, FLOH is devoid of text, which means that each of its images serves as one of these ‘promissory notes’ or ‘enigmatic prompts’ to others in the collection. Foster further observes that artists with archival intentions ‘are often drawn to unfulfilled beginnings or incomplete projects – in art and in history alike – that might offer points of departure again’. This statement aptly describes Dean’s approach to her book, since she is concerned with creating connections between objects that have no apparent associations; ‘unfulfilled beginnings’ and ‘incomplete projects’ relate to the elements of loss, memory, and contingency that are prominently featured. The act of collecting that Foster discusses is both irrational and impulsive, since a collector may not be able to explain why he is drawn to a particular object. Dean’s urge to collect images for FLOH demonstrates her appreciation of chance occurrences and inexplicable connections. While the subject matter of these photographs references past events, her approach to collecting resonates with early avant-garde practices; Dean’s habits are similar to those exhibited by the Surrealists – a group of artists who were known for their impulsive and irrational behaviour. The Surrealists found inspiration in l’objet trouvé, which was any item that was then ‘given new meaning simply by being chosen’. Dean’s – and thus her viewer’s – examination process is therefore twofold: she connects the photographs to her life, but she also imagines the history behind the images and how they came to be found at a flea market. In this sense, FLOH raises the question of what happens to a person’s possessions after he passes away; if the owner does not bequeath them to anyone, belongings are either thrown away or become a contribution to a used goods repository. These objects continue to exist in the physical world, but their initial meaning is now exhausted. However, the appearance of old photographs at flea markets also suggests that there is difficulty in completely disposing of such ephemera. To destroy a photograph is to deny it access to future viewers who may find it meaningful. I do not want to give these images explanations: descriptions by the finder about how and where they were found, or guesses as to what stories they might or might not tell. I want them to keep the silence of the fleamarket [sic]; the silence they had when I found them; the silence of the lost object [emphasis added]. [f]ilm is mute. To record sound in film, it has to be done separately, on a separate piece of equipment. Sound is not an inherent part of film, since the image is created first and then sound is added; an absence of sound allows film to retain its subjective quality. This lack, moreover, may encourage a viewer to impose his own meaning. Besides its content, the design and layout of FLOH contribute to an understanding of it as an example of an anomic archive. The version of FLOH from which I worked is the hardcover copy that is bound in linen of a yellowish hue with the title printed in a sans serif font on the cover. Another hardcover version depicts two older gentlemen enjoying popsicles on a hot summer day. FLOH omits categorical tags, page numbers, captions, information on its publisher, as well as accompanying texts, such as essays on the book’s content. These omissions prompted Dean to refer to FLOH as a ‘book without words’. The absence of tags and text is particularly notable in relation to Dean’s other artworks, which contain accompanying material that elaborates and imagines the history of their subject matter. These include Girl Stowaway (1994) and Disappearance at Sea I and II (1996, 1997), which were both outwardly inspired by real-life events. Dean does not take the same liberties with FLOH and instead uses layout as a tool with which to provoke questions. It is also important to note that the layout and arrangement of the photographs do not suggest how a viewer should engage with FLOH. The photograph arrangement sometimes depends on whether Dean purchased them singly or in clusters, and images that contain the same subject matter are sometimes, but not always, kept together. This is demonstrated by the triptych of family photographs at the beginning of the book, where a page has been dedicated to each one. Here marks one of two examples where a page folds out to accommodate an extra image. Dean also separates images that were previously part of the same collection – a formal decision that makes the viewer pause and question whether the image they are seeing is connected to an earlier one. At the beginning of the book, an image of two young women (presumably sisters) is enlarged and spread across the gutter (Fig. 3). Later on, a smaller, 5×7 inch photograph depicts two women out for a walk (Fig. 4). 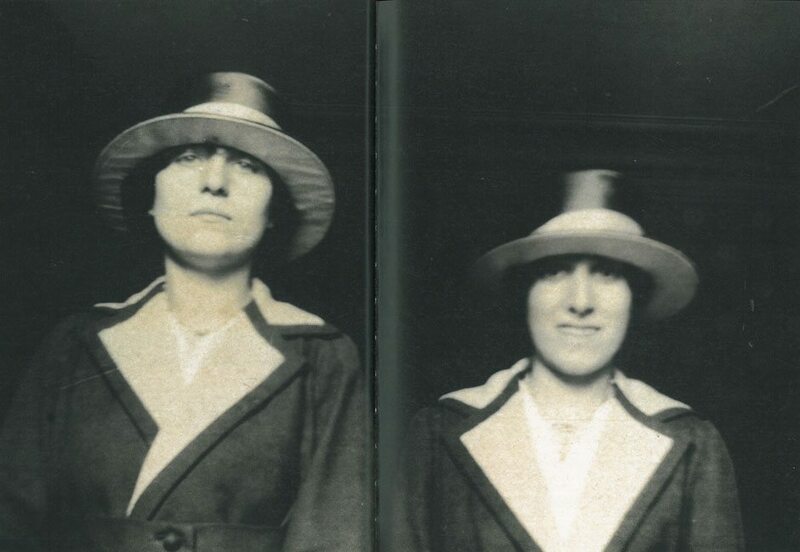 While these women are similar in size, appearance, and dress to the ones featured at the beginning of the book, their faces are slightly blurred, preventing any confirmation. The decision to enlarge an image is repeated a few more times throughout FLOH, such as with the image of the tulips and lilies; however, other photographs vary in size and usually occupy only one page. At other times there is a photograph on one side but the accompanying page has been left blank, denying the image any visual complement. One rare case shows two images of a family at the beach stacked on top of one another: why were these images not given their own page, especially since the accompanying one is blank? This inconsistent arrangement occurs throughout FLOH. To borrow from Mark Godfrey, ‘[t]here seems little logic to this design, no archival or serial principles that might be obeyed.’ The viewer is therefore free to engage as he chooses, to form categories or associations depending on personal experience, and imagine why Dean presented the images in such a way. Fig. 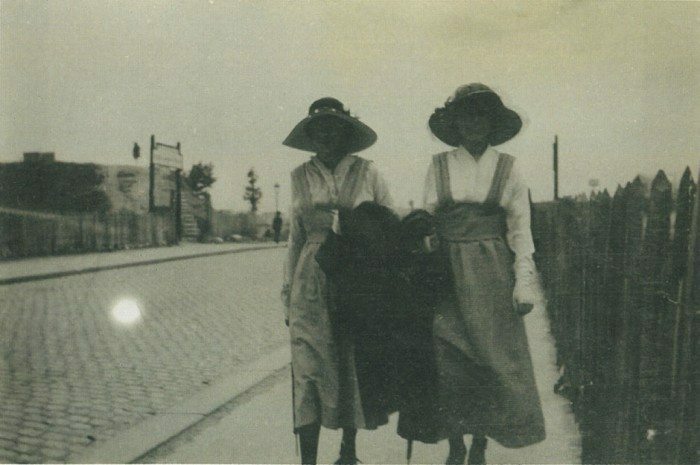 3: Two young women at the beginning of FLOH. Fig. 4: Are they the same young women? Similar to the layout of FLOH, patterns do not immediately emerge from the subject matter in the photographs. The book opens with two 5×7 inch images of two identical Audi sedans – there is one image on each page, and the only difference is that the two women who are present in the first image are absent from the second one. This is the first example of a motif of doubling that exists throughout the book. The following photograph of the two girls that was previously mentioned contributes to this motif. While a viewer may assume that FLOH consists of various representations of doubling, Godfrey observes that this pattern does not last: ‘[t]he photographs in FLOH…are hardly arranged by theme, and when a particular sequence is so arranged, another ‘‘theme” intrudes.’ The content also varies widely throughout the book on both a subject and temporal level: there are photographs of people (old and young, candid images, early portrait photography, group shots, and single subjects), images of rural landscape as well as urban terrain and rundown buildings, and animals. The viewer also sees canted angles that add no artistic merit to the image, test shots presumably from the beginning of a film roll, subjects who were unaware that they were being photographed, and so forth. While the subject matter and formal characteristics vary, they do have one thing in common: they all demonstrate different parties engaging with analogue film throughout the 20th century, and likely into the 21st. Godfrey’s observations on the anti-aesthetic nature of these photographs echo this thought: ‘[p]hotographs might be imprints of light on light-sensitive papers, but this guarantees little in terms of iconicity – whatever the photographer intended, photographs might witness the mechanical limitations of the camera or the accidents of the darkroom.’ These, however, are the characteristics that came with the democratisation of photography: no longer did subjects have to sit for long periods as their likenesses were captured, but rather were free to experiment at their leisure as cameras became more available throughout the 20th century. [t]here are as many categories of photographs to which nobody devoted a single line in the specialist magazines of the period [early 20th century]. Yet these photographs, evolving, adapting, disappearing as they did, marked the rhythm of individual human lives. Though Frizot uses photographs from print media to illustrate this point, his observation still pertains to the photographs included in FLOH, since they also mark the rhythm of individual human lives and serve as temporal records, despite their unknown origins. If this stance is assumed, FLOH can be further considered in light of a photo album, which is interwoven into the complex institution of the family but is also known for its malleable nature. Annette Kuhn suggests this relationship in the following manner: ‘if the family album produces the family, particular forms of family in particular ways, there is always room for manoeuvre within this, as within any other, genre’. It is important to note the significance of familial material, since many of the photographs featured in FLOH likely came from albums or were taken at family events. While this material may be more personal, Kuhn’s observation of the family album as a construction intimates that the viewer is welcome to read into the photographs. Godfrey’s thoughts on viewer relation to the photographs in FLOH support this reading: ‘[a]s you page through the book, you do not really “shudder” at your lack of real knowledge of the subject – you never really knew them in the first place.’ The viewers of FLOH are temporally and emotionally disconnected from each of the photographs’ subjects, and it is this distance that further helps alleviate any feelings of guilt that may be experienced after viewing previously private images. FLOH extends an open invitation for its viewer to look. There is also a palimpsestic quality to these images, since scratches, folds, and other markings of wear and tear accumulated before the photographs were included. It is these additions that return us to the tactile quality that the photographs and other analogue images in FLOH exhibit, since a viewer may therefore feel as though he can ‘touch’ a photograph with his eyes. This multi-sensory experience has been explored by Laura Marks, who argues how a viewer can perceive a film’s texture in her study of haptic visuality: ‘[t]he works I propose to call haptic invite a look that moves on the surface plane of the screen for some time before the viewer realizes what she or he is beholding.’ While the photographs featured in FLOH may not cause the viewer’s gaze to penetrate the image as it would when engaging with the intercultural films that Marks discusses, it is still important to note that their texture can elicit a reaction from the viewer that is different from a pristine image captured by a digital device – a visual dichotomy that echoes the objective of The Green Ray. Characteristics that allow for such a reaction are not commonly found in images that are digitally captured and reproduced, unless they are intentionally added later for effect. Computer software including Adobe Photoshop and even Apple’s iPhoto also allow for any temporal markings to be omitted from present-day reproductions. The fact that the photographs in FLOH have not been intentionally altered allows them to be a true testament to their past. These traces provoke the viewer to imagine not only the history behind the moment captured, but also what happened after a photograph was developed as it made its way from an owner’s collection to the flea market and finally into Dean’s book. The photographs have also been touched in the sense that they have been handled. This point further involves the tactile experience that FLOH exhibits and encourages. 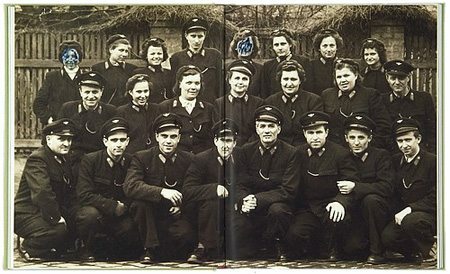 The most prominent example of this is an image of a group of 23 military personnel divided into three rows (or possibly even airline personnel, according to Godfrey) that was presumably taken during the 1940s (Fig. 5). The faces of two young women in the back row have been violently marred with blue ink, inciting the viewer to question who committed this act and for what reason. 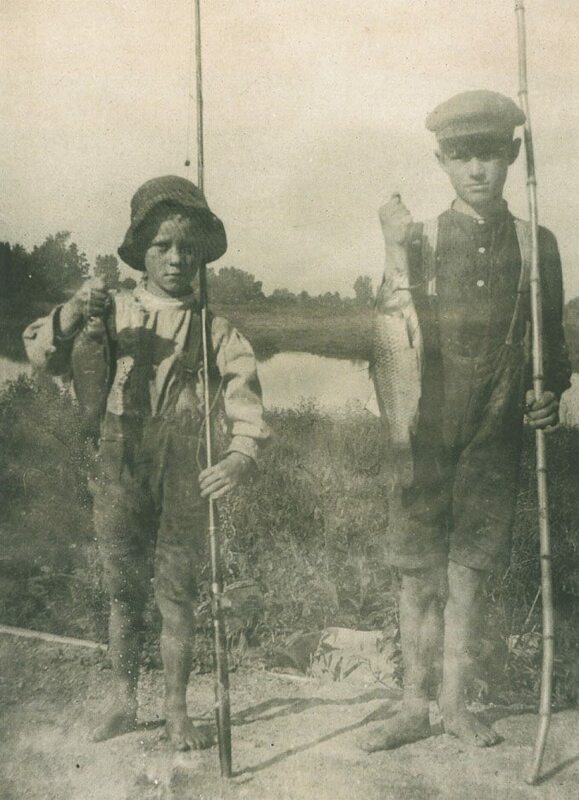 Similarly, a photo of two boys on a fishing trip precipitates a similar effect since the viewer can see a fingerprint embedded onto the face of the boy on the left hand side – someone lingered upon this image, leaving an indexical referent upon another indexical referent (Fig. 6). Other photos have less intrusive markings, such as the names of their subjects or dates, which prompt the viewer to question if the person who took the photograph feared forgetting the subject’s name, or where and when the photograph was taken. All of these supplementary elements bring another person into the image and further complicate the relationship between the photographer, collector/artist, and viewer, since their additional layers imbue the images with an emotional charge that forever exists whenever someone else views them. In the case of the image of the military personnel, this additional person could be the assailant. Is this person included in the shot or is he completely unaffiliated with the group? Fig. 5: Ink mars the faces of two female officers. Fig. 6: A fingerprint lingers upon the face of the boy on the left. [i]mages which idealize (like most fashion and animal photography) are no less aggressive than work which makes a virtue of plainness (like class pictures, still life’s of the bleaker sort, and mug shots). There is an aggression implicit in every use of the camera. While Sontag wrote this description in the 1970s, its relevance is even more pertinent in the 21st century as the camera’s inherent aggression has become even more pervasive. Digital cameras are cost-effective and easy to use, having become ubiquitous as a result. A moment can no longer simply be experienced, but is instead aggressively documented. The photographs that have been visibly marred exemplify how aggression continues after a photograph is taken. The punctum can therefore be interpreted as aggression manifested – though the punctum is something that cannot be named, visible markings reveal its plausible identity. For example, in the image of the military personnel, the unexplainable sensation that the punctum evokes was likely seen in the women’s faces or some quality about them; the viewer of the photograph felt compelled to act upon this swell of emotion and inked the faces. The same observation can be made about the images of the two boys: while the fingerprint may not signify aggression, it is the result of the emotion that the viewer felt while holding the image. These indexical representations allow the viewer’s emotions to be vocalised to future viewers of FLOH. The notion of the punctum therefore helps explain how viewers may feel emotionally connected to someone else’s personal memories. The photographs and layout of FLOH already encourage an active viewer, but certain qualities (such as these markings or others) also have the power to prick the viewer in a way that even they cannot explain. This emotional response is commonly felt with artworks of an archival nature. As Foster remarks, ‘[archival] artists often aim to fashion distracted viewers into engaged discussants’. This is encouraged by the lack of text in FLOH, which leaves viewers to fill in the blanks while simultaneously creating a similar viewing position that is encouraged by photo albums, where more than one person can engage with the book at the same time. The photograph is therefore subjective to the photographer, Dean, and the viewer, where these two latter parties extend the photograph’s temporality beyond the space in which it was created. To borrow from Foster, we could even describe Dean as an artist who ‘recalls lost souls’ and is ‘often drawn to people, things, and places that are stranded, outmoded, or otherwise sidelined’. This description can be further extended to include the medium of film itself, which must presently demonstrate its value or risk being dismissed into the ether. Dean’s latest work therefore serves not only as a paean to film, but also as an example of how this medium can continually be re-imagined in a dynamic way. Even before commencing FILM, Dean had been quite vocal about her appreciation of analogue film technology and its capabilities, as well as her fear that this medium will soon disappear. This was demonstrated not only through her artwork, but also through contributions to newspapers and texts that accompanied her exhibitions. Dean has also cited closings of photochemical labs and the scarcity of 16mm film stock as harbingers of worse things to come. The inspiration for FILM was clearly borne out of these concerns. Dean cites a visit to Austria to install her latest work at MUMOK in Vienna as the event that inspired the direction of her project. It was Oscar night 2011 that specifically informed her ideas, as she turned on the television after not being able to fall asleep and recalls watching a man discussing the awards. Much to Dean’s surprise, this was the man she was to meet the next day at the Austrian Film Museum: Alexander Horwath, the museum’s director. In Horwath, Dean found a kindred spirit who shared her concerns regarding the future of analogue film technology in an increasingly digital world. The atmosphere of contingency that surrounds their meeting is particularly fitting for an artist who greatly values this quality in her own work. Soho Film Lab in London further inspired FILM, since it recently ceased processing and printing 16mm film stock – a decision that almost hindered the completion of Dean’s MUMOK project. As of February 2011, Soho was the last professional lab in the UK that developed 16mm; this is where Dean brought her own negatives. Dean would have had to look elsewhere to have the film for her Unilever Series commission processed and printed if Deluxe (Soho Film Lab’s new owner) had stopped working with 35mm film as well. A national element could have been absent from FILM if Dean would have had to send her negatives abroad to another film lab. This absence may still occur with regards to Dean’s 16mm works. Dean explains: ‘I order countless prints each year, as projecting my films on loop systems in museums and galleries means that they become scratched and exhausted.’ The closure and downsizing of film labs greatly affects Dean’s work and will also prevent younger artists from being able to experiment with analogue film. A generational divide is thus created as this filmic medium becomes increasingly less accessible and threatens to become obsolete. To draw attention to analogue film through installations and publications is to afford the medium new momentum and provoke the public to take notice of its situation. [a]s any practitioner will testify, digital and analogue formats are markedly different. The constraints and disciplines of working with a medium are essential to shaping the finished product. Dean’s and Cullinan’s views resonate with Rosalind Krauss’ campaign to recognise the legitimacy of medium specificity – a project that was initially prompted by ‘contemporary art criticism that has been confronted with the pervasive power of electronic and digital media to challenge the concepts of a medium and its specificity in the name of convergence’. Instead of assuming a modernist standpoint and considering a medium in terms of its finite, physical properties, Krauss examines its conventions and possibilities and how these characteristics allow it to exist as a ‘supporting structure’. Krauss asserts that nostalgia should not be the lens with which to examine cinema. She is instead interested in works in which the artist expresses his creative vision while simultaneously revitalising the potential of the medium. It is this observation that particularly informs Krauss’ interest in Dean’s oeuvre (she expanded upon her thoughts on Dean at Tate Modern in March 2012). While Dean’s work can be described in terms of ‘ruins, remnants and obsolescence’, one must not forget that there is also a process of (re-)invigoration that occurs. This is inferred by her interest in recalling ‘lost souls’, using found objects, and re-imagining the medium of film for her own creative endeavours. These characteristics are particularly crucial since they orient Dean’s work toward the future, while simultaneously taking the past into account. This suggestion recalls the earlier observation of how both FLOH and archival work in general exhibit a dual temporal position. Film’s existence should not be considered merely in terms of its history, since this perspective emphasises the medium’s past states with little regard for how it has evolved. [a] truism of our times is that film is not what it used to be…. Film is no longer spatially demarcated in the institutional sites of cinemas, but ubiquitous. Harbord here draws attention to the spatial element of film and how it is no longer strongly tied to the physical environment of the cinema. Her observation is particularly relevant to an understanding of FILM and its exhibition environment. Dean’s installation, which concerns a medium that is fighting for its existence, was exhibited inside Turbine Hall (part of the Bankside Power Station that was purchased by Tate Modern in 1995). Dean reinvigorates a quickly disappearing medium within an exhibition space that has itself reinvigorated its part of London. Dean further creates a relationship between her work and its exhibition setting, as the viewer can look through the screen displaying FILM at the building’s structure. Moreover, the Bankside Power Station was likely never imagined as an artistic space when it was constructed in the early 1950s. Just as film now evades the constraints of the cinema, unused buildings and spaces – other lost souls – have undergone urban renewal and are re-appropriated for artistic purposes. The presence of FILM inside Turbine Hall therefore reiterates the process of reinvigoration that is currently taking place in cinema, architecture, and numerous other artistic fields. Dean decided to use only the smaller area behind Turbine Hall’s stairs. FILM stands 13 metres high against the eastern wall and windows; it replicates the look of a 35mm strip of celluloid film, complete with sprockets. The installation is highly self-reflexive: a 35mm looped film that is 11 minutes in length is projected onto the constructed 35mm film strip. This work also marks Dean’s foray into 35mm film, as well as the first time she has created a vertical projection. This vertical monolith was prompted by Dean’s desire to create a portrait for film by turning the lens used for creating a double-width landscape format 90 degrees. René Daumal’s Mount Analogue – a text he wrote while living in occupied Paris during the Second World War – also inspired the shape of FILM. As Dean recounts, ‘Mount Analogue: analogue, which has now come to mean all that is not digital, proposes a place, a mountain, a realm of the mind that can be reached by those who feel, in fact necessary, to do so.’ Dean began work on the content of FILM by creating her own Mount Analogue, with a shape and appearance that was inspired by the mountains depicted in Dean’s postcard collection and by her examination of other portrait-style postcards – an act that recalls the power of the flea market photographs in FLOH and the potential of unknown images to speak to the viewer. 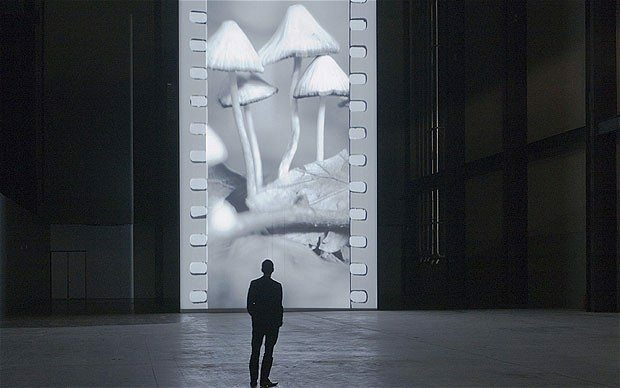 The subject matter in FILM further recalls the anomic process of archiving that was previously seen in FLOH: the viewer sees images of a mountain, wild mushrooms, trees, and foliage, a moving escalator, colour block patterns, hand tinted stills, as well as Tate Modern’s building and what literally exists beyond the film’s screen (Fig. 7). It is a combination of images from both natural and man-made environments, a relationship that is reinforced by Dean’s use of the camera – a modern mechanical device – to capture how she sees the world. The elements in FILM therefore incite its viewer to consider the medium on both a conceptual and material level, while simultaneously referencing an earlier period in cinematic history through multiple exposures, mirroring, and matte painting. The technique of masking also allowed her to create the peephole effect that was so commonly seen throughout the silent era of cinema. This desire to formally reference and recreate an earlier period in cinematic history is of interest to many contemporary artists and filmmakers. Canadian filmmaker Guy Maddin, for example, continually conjures up the past through his formal decisions and use of archival and found footage material. Maddin’s recurring motifs of hands and touch also allow him to illustrate the tactile relationship that the filmmaker has to his work, as well as demonstrate the connection that can be made between film and archival practice. Dean similarly calls attention to these themes and issues in FILM. For example, she wants her viewer to know that the material for this project was not altered beyond the grading from the film lab and the editing that took place in her workroom. She also wants her audience to be aware of the creative and technical process behind the installation. The catalogue and its online version – an interactive complement that reiterates the tactile quality to Dean’s work as the viewer is guided through a step-by-step narrative of the creation of FILM – particularly demonstrated this objective (Fig. 8). The first step displays the supplies needed to work with film; the white cotton gloves are particularly notable since they strengthen the correlation between Dean’s artistic works and her archival goals. The physical catalogue also included a strip of film, giving readers an idea of Dean’s tactile experience as she splices her material together. Fig. 7: The verticality of FILM. Fig. 8: Tate Modern’s online catalogue for FILM. the museum is a heterotopia not because it contains different objects, nor because it contains or juxtaposes different times, but rather because it presents a more profound kind of difference: the difference between objects and concepts. What every museum displays…is the difference inherent in interpretation. Museums are heterotopias not only because of the different objects they display, but also because of how these objects are represented and eventually discussed. Exhibiting FILM in a museum setting (a work of art that can be considered anomic) is itself a subversive act, since FILM resists categorisation. Many contemporary museums no longer enforce such strong categorical and pedagogical approaches to their collections, but rather encourage viewers to attribute their own meanings to a work of art – which recalls a viewer’s relationship to artists’ books, such as FLOH. As Lord remarks, ‘[m]any museum displays today encourage visitors to consider how objects are related to concepts and categories and whether they might be interpreted otherwise, in other social or cultural orders.’ The structure of Tate Modern’s exhibition space also encourages a plurality of interpretations: ‘[t]he Turbine Hall through its open programmatic variety appears to allow an arena of experiences, observations and narratives to take place.’ FILM can therefore be read on its own, as well as in relation to Tate’s other artworks, exhibitions, and previous Unilever Series commissions. 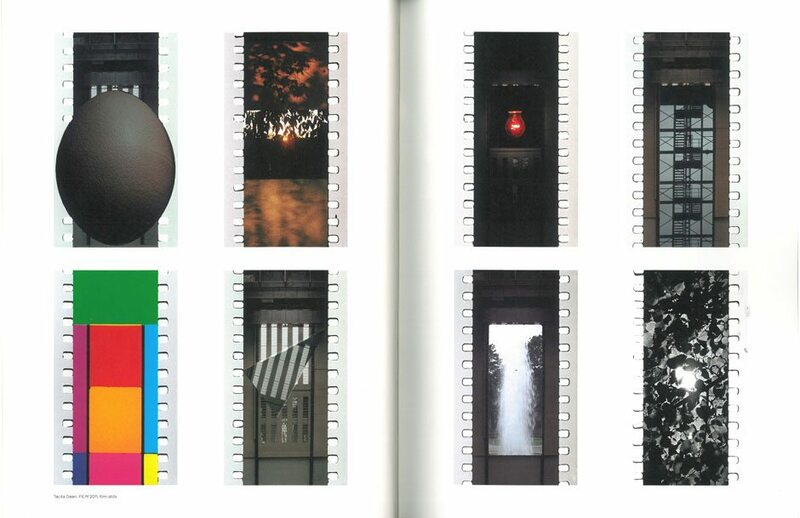 Similar to FLOH, the images in FILM can be read isolated or in relation to each other; the catalogue does not imply how it should be experienced. It includes essays by Dean, Cullinan, and other film and archival professionals, but it does not impose meaning onto the installation or recommend how it should be received. Tate Modern instead respected the organic quality with which Dean imbues her artwork and recognised that FILM represents something personal to each of its viewers. [t]he Unilever Series can be described as being constructed around the notion of event-time. Foucault applied the concept of temporary event time, which could be applied to a site that would temporarily be altered through an event…. This type of heterotopia of illusion allows actors to manipulate and alter images and values within an urban system by manipulating symbolic icons within communication systems. Dean’s reading not only applies to ephemeral events, such as Nina Jan Beier and Marie Jan Lund’s Clap Time and flash mobs, but to the longer commissions as well, since they also have a determined beginning and end. The exhibiting of FILM within this heterotopia of illusion further comments on cinema’s transitory nature, since films that receive a theatrical release are also bound by temporal restrictions. These restrictions apply to museum exhibits, since they may influence how a work of art is received, such as whether a viewer visits it multiple times or rushes to see it on its last day, when the exhibition space is likely crowded. Eilean Hooper-Greenhill has drawn attention to the importance of exhibition space in her study of contemporary exhibitory practices. As museums attempt to be less formal and authoritative, they create more immersive possibilities and thus encourage visitors to engage with their material on many levels. This is especially characteristic of the post museum, a concept that Hooper-Greenhill applies to museum spaces that aim to challenge visitors’ visual expectations: ‘[f]ormally austere spaces, established as sites for the use of the eye, have been reinvented as spaces with more colour, more noise, and which are more physically complex.’ Whereas the empty space of Turbine Hall may not immediately invite the same level of engagement as exhibition environments that continually employ the use of screens, projections, and sophisticated touchscreen technology, it still stands in contrast to the formal layout of the modernist museum, which advocated strict classification schemes and a ‘look but do not touch’ policy. Turbine Hall is a malleable space that adapts to the needs of each featured artist, many of whom want visitors to engage with their works on a personal, embodied level (Fig. 9). Fig. 9: A viewer marvels at FILM inside Turbine Hall. Turbine Hall also demonstrates how museums no longer emphasise a purely ocularcentric experience and instead attempt to elicit a visitor’s other perceptual senses. Its cavernous space may even encourage a viewer to engage with FILM on a multi-sensory level, since the viewer is welcome to walk around, sit and relax, discuss with other visitors, and view the installation from different perspectives – this latter experience making FILM akin to a work of expanded cinema. A viewer’s attitude also influences their relation and reaction to the installation. Richard Dorment suggests that a viewer must visit FILM more than once to experience a greater effect: ‘[y]ou really cannot understand it all having seen one view and you’ve got to go back again and again.’ A viewer’s interaction with Turbine Hall is especially important since FILM is not a permanent exhibit. The impact must live on in the viewer’s memory after this heterotopia of illusion disappears. Dean’s FLOH and FILM demonstrate a process of collecting that deviates from institutional archival practices. Viewers of both works are asked to assume a subjective relation to the photographs and images by drawing connections to their own personal experiences. They may also attribute their own categories and patterns to the material, since neither Dean nor the supplementary writings on these works impose any fixed meaning. Dean also helps her viewer connect with the material through emphasising the tactile element to collecting, archiving, and viewing photographs and how this relationship does not exist when images appear solely on a computer screen or memory device. This process is further demonstrated in FILM through Dean carefully crafting and assembling the images by hand. [digitization] pushes beyond democracy and becomes almost totalitarian. It [parallels the way] society is trying to organize itself to get rid of anything that is dysfunctional or not up to standard. Van Alphen also draws this parallel between archival practice and totalitarian politics in his discussion of the Nazis’ meticulous record-keeping and their desire to document their extermination of the Jewish people: ‘[l]ike objects in an archive or museum, the inscription [tattoo] classified them as traceable elements within a collection.’ While van Alphen’s observation does not concern itself with digital matters, it does reiterate the negative repercussions of archival practice and how inclusion in a collection can decontextualise objects (or people) and render them absent. By drawing attention to material that is devoid of meaning and considered unwanted, Dean demonstrates how these objects can be resuscitated and put to new use. Her artworks therefore serve as a larger comment on societal practices that advocate the disposal or alteration of anything that is no longer deemed superior. [t]he illusion of movement in cinema has been explained by what physiological optics names the phi effect, which means the stimulation of the viewer’s retina by the light refracted through each frame into the perceiver’s eye. That stimulation producing an afterimage or ghostly trace of the light now hallucinated in its complementary colour. An excess appears as the frame transitions from one to the next, permitting a trace of the previous image to linger upon its successor. The appearance of a ‘retinal halo created by staring at images for far too long’ further intimates that there is a temporal aspect to afterimages, which even pertains to still images. These observations regarding the characteristics of afterimages allow film to exist as a ghost in its own projection, haunting the viewer after he leaves the cinema (or, in this case, the exhibition space). This is particularly important for the images of FILM, since the exhibition will end and then only exist as a memory for those who frequented Turbine Hall and engaged with this space. What is even more notable is the fact that Unilever’s 12-year monetary commitment to the project has come to an end. These Associations, Tino Sehgal’s commission, is the last to take place before funding ceases and sections of Tate Modern undergo renovations. [j]ust as one would not think of simply scanning a medieval manuscript before dispensing with the original, or hanging a postcard in a museum in lieu of a prized oil painting, film has its own particular inherent beauty and is not simply replaceable as a medium by digital technology. Its obsolescence will result in irretrievable losses in all that we may no longer be able to see and experience, and in what we will no longer be able to make, because we will have forfeited the technology and knowledge to do so. [film] is a beautiful medium. It is a different medium. Let’s keep it. Caylin Smith completed her B.A. (Hons.) degree in English (Cultural Studies) at McGill University in 2010. She is currently pursuing her master’s degree in the Preservation and Presentation of the Moving Image program at the University of Amsterdam and interning at EYE Film Institute Netherlands. 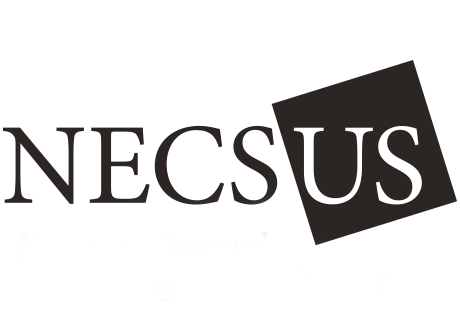 She would like to thank NECSUS_European Journal of Media Studies for this opportunity. She would also like to thank Catherine Knowles and Mirah Ippolito for editing versions of this paper, as well as for their helpful suggestions and support. Amad, P. Counter-archive: Film, the everyday, and Albert Kahn’s Archives de la Planète. New York: Columbia University Press, 2010. Barthes, R. Camera lucida: Reflections on photography translated by R. Howard. New York: Hill & Wang, 1994. Dean, C. ‘From Flash Art to Flash Mob: Art in the Age of Spectacularisation’ in Curating architecture and the city edited by S. Chapman and A. Stara. Routledge, 2009. Print. Dean, T. ‘FILM’ in FILM edited by N. Cullinan. London: Tate Publishing, 2011a: 15-45. _____. FLOH. London: Steidl, 2009. _____. ‘Save Celluloid, for Art’s Sake’, The Guardian, 22 February 2011b, http://www.guardian.co.uk/artanddesign/2011/feb/22/tacita-dean-16mm-film (accessed on 10 September 2012). Durkheim, É. Suicide translated by J. Spaulding and edited by G. Simpson. New York: Free Press, 1997a. _____. The division of labor in society translated by L. Closer. New York: Free Press, 1997b. Foster, H. ‘An Archival Impulse’, October, #10, 2004: 3-22. Foucault, M. ‘Different Spaces’ in Aesthetics, method, and epistemology (Essential works of Foucault, 1954-1984, Vol. 2) edited by J. Faubion. New York: The New Press, 2001: 175-185. _____. Power/knowledge: Selected interviews and other writings 1972-1977 edited by C. Gordon. Pantheon Books: New York, 1980. Freeman, M. The photographer’s mind: Creative thinking for better digital photos. Waltham: Focal Press, 2001. Frizot, M. ‘Rituals and Customs: Photographs as Memories’ in A new history of photography edited by M. Frizot. Hagen: Konemann, 1999: 746-757. Godfrey, M. ‘Photography Found and Lost: On Tacita Dean’s Floh’, October, #114, 2005: 90-119. Hooper-Greenhill, E. Museums and the interpretation of visual culture. London: Routledge, 2000. Kaufman, D. ‘Film Fading to Black’, Creative COW Magazine, 2011, http://magazine.creativecow.net/article/film-fading-to-black (accessed on 13 September 2012). Kim, J. ‘The Post-Medium Condition and the Explosion of Cinema’, Screen, 50:1, Spring 2009: 114-123. Krauss, R. A voyage on the north sea: Art in the age of the post-medium condition. London: Thames & Hudson, 2000. _____. ‘Reinventing the Medium’, Critical Inquiry, 25:2, Winter 1999: 289-302. _____. ‘Tacita Dean’s FILM’, Tate Modern, London, England. 8 March 2012. _____. Under the blue cup. Cambridge: MIT Press, 2011. Kuhn, A. Family secrets: Acts of memory and imagination. London: Verso, 2002. Lord, B. ‘Foucault’s Museum: Difference, Representation, and Genealogy’, Museum and Society, 4:1, March 2006: 1-14. Macdonald, S. ‘Exhibitions of Power, Powers of Exhibitions’ in Museums and their communities edited by S. Watson. London: Routledge, 2007: 176-196. Olalquiaga, C. ‘The Researcher as Collector’ in What is research in the visual arts? : Obsession, archive, encounter. Clark Art Institute: Williamstown, 2009. Sontag, S. ‘On Photography’ in Communication in history: Technology, culture, and society, 4th edition edited by D. Crowley and P. Heyer. London: Allyn & Bacon, 2002: 174-178. The Oxford English Dictionary, s.v. ‘Anomie’, http://oxforddictionaries.com/definition/english/anomie?q=anomie (accessed 11 July 2011). Rodowick, D. Afterimages of Gilles Deleuze’s film philosophy. Minnesota: University of Minnesota Press, 2009. Van Alphen, E. ‘Obsessive Archives and Archival Obsessions’ in What is research in the visual arts? : Obsession, archive, encounter. Clark Art Institute: Williamstown, 2009. Vanden Meersch, E. Implants. Ghent: MER, Paper Kunsthalle, 2006. The Oxford English Dictionary 2011. Van Alphen 2009, p. 66. Van Alphen 2009, p. 76. Dean, Frith Street Gallery, 2012. See Krauss 2011 and her ‘Two Moments from the Post-Medium Condition’ (2006). Krauss describes this term in A Voyage on the North Sea: ‘in order to sustain artistic practice, a medium must be a supporting structure, generative of a set of conventions, some of which, in assuming the medium itself as their subject, will be wholly “specific” to it, thus producing an experience of their own necessity’ (p. 26). FILM calls this term to mind since it challenges the established cinematic dispositif and evades the screening environment of the cinema. Qtd. in Godfrey 2005, p. 114. Van Alphen 2009, p. 67. IMAGO: European Federation of Cinematographers 2012.